Are you looking for a way to help your child learn about nature in a fun and exciting way? The Overland Park Arboretum is holding several outdoor classroom activities this Spring. 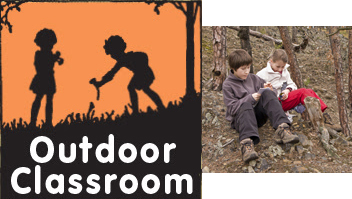 These are an excellent way to introduce outdoor educational concepts in a fun setting. Students will learn about the world of plants and animals through observation, hikes, games, stories and more at the Arboretum. The cost for these outdoor classroom offerings is $5 per student, along with regular Arboretum admission fees. Become a botanist for the day and explore the fascinating world of trees in their natural surroundings. Through short hikes, stories and hands-on activities, students will learn the parts of a tree, how they grow, and how big they'll get. Take a walk on the wild side and explore the Arboretum grounds looking for the different places animals make their homes and raise their young. Students will use their imaginations as they roll-play with puppets looking for food and a place to live. Roll-up your sleeves and dig in as students explore the world of plants and how they grow. Little gardeners will learn how to make a garden, plant seeds, have a scavenger hunt, and go hunting for bugs. Explore the secrets of the season as we visit the Arboretum's colorful and fragrant gardens. Why do flowers have different shapes, sizes, colors and smells? Why do bees, butterflies and hummingbirds visit these flowers? Join us and find out. Autumn is a time of dramatic change in the garden. Students will hike through the garden and discover why the leaves change color and fall from the trees. We'll search for other signs of fall and look for acorns and other tree nuts and learn about the animals that depend on them. We will even help the birds and animals by making outdoor tree ornaments for wildlife to feast on. For more information on these outdoor classes, visit the Arboretum website or contact the instructor, Carolyn Dewey, at 913-897-2991.